Down at Caves Folly Nursery in Colwall, Bridget is reflecting on the long hot summer. Autumn is here and we are enjoying the colourful finale to a very challenging growing year. It has been interesting to hear that many of my customers lost more plants in the dry summer than in the cold of winter. We grow such a large selection of plants in our gardens which originate from all over the world. This means that they often come from different climates and grow in a variety of soil types. Consequentially, we cannot always succeed in keeping them in extreme weather conditions. 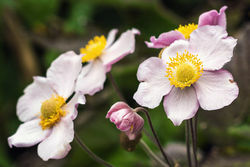 The group of plants I have found the most versatile are the alpine plants. This includes plants from high up in the mountain scree to the plants in the alpine meadows and woodlands. Most of these plants will tolerate poor soils and extreme temperatures. Some of these include Gentians, Saxifraga, Anemone, Armeria, Erysimum, Achillea, Thyme and Phlox from higher levels, down to the meadow and woodland plants such as Iris, Trollius, Potentilla, Polygonatum, Primula, Solidago, Geraniums, including small shrubs such as Azalea, Rhododendron, Hypericum. Many of our cultivated garden plants originate from plants that grow in the mountainous areas of Europe. These plants will withstand extreme cold and intense light levels and given a free draining soil they battle most extreme conditions. If you want to keep your plants through the harsh extremes of climate change then plants from the northern hemisphere are the best options. Potentially that could be very boring as none of us can ignore that endless array of delights from South Africa! Here are some jobs that need doing in October and November. Clear and prepare vegetable beds. Remove all plant debris to avoid spreading diseases. Plant autumn garlic and onions. Complete lifting potatoes before they get frost damage. Order bareroot fruit trees and bushes. Apply barrier glue or grease bands to prevent winter moth damage on fruit trees. Cut back summer fruiting raspberry canes. Prune and shape roses to reduce damage from winter winds. Cut back and divide perennials. Collect ripe seed from plants such as Verbena bonariensis to keep in a dry place ready for sowing in spring. Plant up pots with spring bulbs and winter bedding. Plant bulbs in borders and to naturalise. Mulch borders to trap in the warmth of the soil. Move any shrubs, water well before and prune evergreens to help reduce water loss. Leave any berries or seeds on borders and hedges for the birds. Keep a corner of the garden ’untidy’ for hibernating mammals. Allow some ivy to mature and flower, it is a great source of nectar and berries. Check bonfires for hedgehogs before lighting. This summer has been challenging and exhausting trying to keep plants alive, but what fabulous weather we had for being outside and enjoying the garden.